True ownership of one share of Spotify stock framed like you want. The recipient becomes a real shareholder of the company. 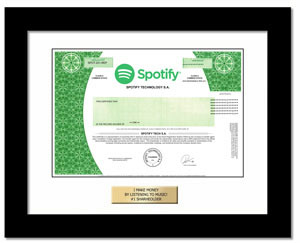 We expect that like other IPO's, Spotify will not issue paper certificates and register ownership electronically instead. Our replica for display purpose is attractive, ornate, and modern. Spotify is the largest global music streaming subscription service.